The Incoherent Ramblings of a Stay at Home Mom: Wordless Wednesday! Me Snuggie. How to Extract a Baby with a Tool Kit. The Tale of Two Trees. Not Just a Mommy Blog. For the Love of Etsy. NOT FAIR!!!! I've been wanting a slanket for months and did I get one? NO!!! I got a really pretty eggplant colored one. 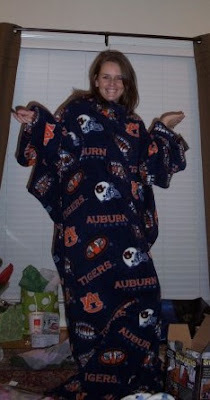 I've been avoiding the Snuggie craze because I thought it was just insanity.